Amicor provides floor coverings with a fresh feeling inside. Amicor when blended with wool in carpets provide floor coverings with a reduced risk of dust-mites and allergens. Amicor is a revolutionary, new fibre designed to improve indoor air quality in bedrooms, living and work rooms by preventing dust mites and their allergen within beds, furnishings and carpets. Although beds may seem the major areas where dust mites can thrive, they can also migrate into carpets and rugs. Amicor provides a safer, healthier sleeping environment and has ample evidence to prove that it reduces allergens at source. Doctors agree that the prevention of the dust mite allergen in the home will help to prevent sensitization that normally leads to asthma. Amicor can be blended with wool to produce carpets that have a reduced risk of dustmites and allergens building up during use. 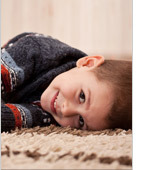 Carpets containing Amicor are definitely a safer alternative to families with babies, children or adults, who love to sprawl in a larger space on carpets or such soft flooring materials. Carpets containing Amicor complete the concept of a healthy bedroom and sleeping environment for those prone to various allergies. Individuals can enjoy a protected zone with comfort of carpets that are safe and soft. Amicor floor covering comes with a wholesome and healthy freshness inside. Amicor wool carpets have a potential to provide an additional levels of comfort and durability thereby adding value to the end-consumers' home investments. Consumers can now choose a specially created carpet that will provide a healthier environment to last for the lifetime of the product.